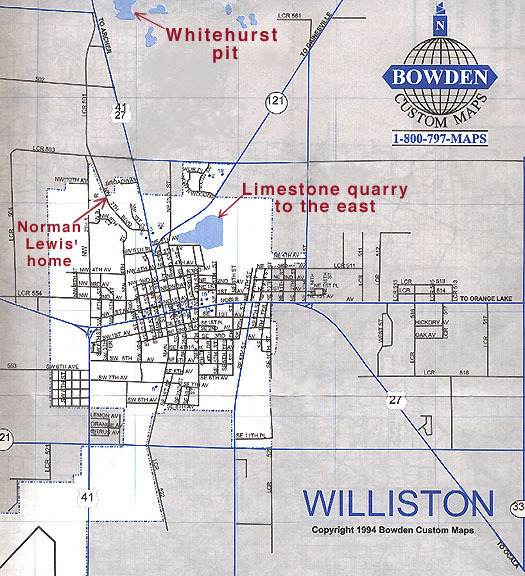 On April 3, 1996, the skeletal remains of seventy-six-year-old Norman Lewis, missing for two years, were recovered from the murky waters of a limestone quarry in the tiny Florida town of Williston, located just southwest of Gainesville. The April 5 Associated Press story, as headlined in the St. Petersburg (Florida) Times, revealed: "Psychic tip leads to missing man's body." Although she was not present during the search or recovery, the "tipster" was Florida "psychic detective" Noreen Renier, who boasts a successful history of assisting in hundreds of police investigations into unsolved homicides and missing-person cases. Before specializing as a "psychic detective," Renier, age 60, was credited with having predicted the 1981 assassination attempt on President Ronald Reagan, and the assassination of Egyptian President Anwar Sadat later that year. Through the years, she has appeared on numerous national television programs including the Joan Rivers Show, Geraldo, Sightings, and even the CBS newsmagazine 48 Hours. In the classic textbook Practical Homicide Investigation, used by the FBI and many other police academies, the author identifies Renier as "a psychic and recognized authority on the phenomena of extrasensory perception." According to press accounts, on March 24, 1994, after telling his girlfriend that he would be right back, the elderly Mr. Lewis drove off from home, leaving behind his wallet and respiratory inhaler, and (along with his truck) was never seen or heard from again. In its April 11, 1994, edition, the Ocala (Florida) Star-Banner quoted Williston Police Chief Olin Slaughter as observing, "It's like he fell off the edge of the earth." After spending more than a year following-up on "hundreds" of leads and conducting numerous land and aerial searches, all to no avail, the Williston police, and the Lewises, decided to enlist the aid of a psychic. Investigator Brian Hewitt suggested Noreen Renier, having previously been impressed by a performance of hers. The Lewis family reportedly provided the $650 fee for her services (the police department was said not to have had sufficient funds). On July 17, 1995, three weeks after Hewitt's initial phone call to her, Renier performed her "psychic" reading, at her home. Clutching one of Mr. Lewis' possessions, she tuned into his vibrations and provided a number of specific clues intended to help lead the police to his body. The Williston Pioneer (on April 4 and June 27, 1996) quoted Chief Slaughter as saying that Renier indicated Lewis had traveled "east from his home to an area where there is . . . water in something like a pit." (Emphasis added.) The Chiefland (Florida) Citizen (April 11, 1996) quotes Slaughter: "She could see he was surrounded by metal. . . . She could see a cliff wall, and loose bricks, a railroad track, and a bridge." The numbers "45" and "21" were also said to have been offered as helpful clues. A subsequent look by the police into several bodies of water proved as fruitless as the earlier searches. But because of Renier's reading, the police called in a team of Navy divers from Jacksonville to search one particular limestone quarry among many scattered throughout the area. Although about eight months elapsed before the team could arrive, on April 3, 1996, with the assistance of a $70,000 detection device, the divers did indeed locate the missing truck containing Lewis' remains, submerged in twenty feet of murky water. When the Williston police announced that the case had been solved largely as a result of Renier's psychic clues, the story quite naturally captured the attention of the media. In addition to regional newspapers and television, the Associated Press and national radio icon Paul Harvey reported upon it, and the TV show Sightings devoted a segment to it in November 1996. The "Williston Case" quickly became the pinnacle of Renier's storied career. My involvement in the Williston case began in May 1996 when I received a telephone call from a researcher for Towers Productions, which was producing a series called The Unexplained for the A&E Network. Their program on "Psychic Detectives" (which first aired in January 1997) would feature several individuals, including Renier, and would specifically cover Williston. My participation was requested to insure a balanced presentation. Two months later, the police and I were interviewed for the show (in Williston), as was Renier the following day (at her Orlando home). By then, I had accumulated a number of newspaper articles and maps and had come to an unexpected and provocative conclusion: Norman Lewis' remains appeared to have been found not because the police had the Navy divers search the body of water best fitting Renier's psychic clues, but because they had the Navy search the wrong watery pit! Scanning my roadmap of Williston, I immediately noticed its most striking feature -- a blue body of water nearly in the heart of town, less than one mile east of Mr. Lewis' home. This limestone quarry, when approached from the west, is located adjacent to the intersection of U.S. 41 and State Route 121. Flipping that map over I saw that the map on the opposite side reveals that U.S. 41 is also known in Williston as State Route 45. If Lewis had indeed traveled east from his home to a watery pit, as Chief Slaughter indicated Renier had seen in her psychic vision, he would have encountered such a quarry just beyond the junction of State Routes 45 and 121. Renier's two numerical clues were reportedly "45" and "21" -- had she offered "45" and "121," someone might have cynically accused her of having researched the case and consulted a map! 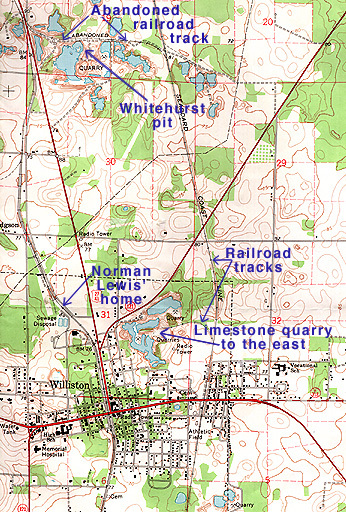 The U.S. Geological Survey's "Williston Quadrangle" map, which I purchased at a Tampa map store, shows this clearly marked "Quarry" area in more detail. Of note is the Seaboard Coast Line's north/south railroad track 3/4 of a mile east of the quarry's eastern circumference, with a branch directed westward into the heart of the quarry area. One of Renier's clues was "railroad track." As I told the Towers producer, I cannot be certain if Renier's clues were the result of "psychic" power or some other, purely natural, process. But, I added, forget about "psychic" power for a moment and just employ "ordinary" detective-style reasoning and common sense. Consider that the intensive ground and aerial searches had turned up nothing. If Mr. Lewis and his truck were somewhere within the potential reach of the Williston police, where could they possibly be? In the middle of a densely wooded area? In an abandoned building? (Either, perhaps, if only a body was missing. But a truck?) Only one possibility even comes to mind -- submerged in a body of water. Chief Slaughter, it seems, had had the right idea all along, even if he was not consciously aware of it. It did indeed appear "like [Lewis] fell off the edge of the earth" -- and into a bottomless, or at least very deep, watery pit. A quick glance at the Williston roadmap revealed an obvious potential site, as confirmed by the U.S.G.S. map. One minor problem: The logical site, the one that Renier's "psychic" clues seem tailored to -- the limestone quarry less than a mile east of Lewis' home, at the junction of State Routes 45 and 121, serviced by a railroad track -- was not where Lewis' truck and remains were ultimately found! Rather, they were located in a different limestone pit, one nearly due north of Lewis' home and more than twice as far away! The recovery site, known as the Whitehurst pit, is also located adjacent to State Route 45, but not Route 121. Renier's "21" clue, in fact, played no beneficial role whatsoever in assisting in the location of Lewis' body. Yet, this clue has been hailed by the police as perhaps her most eerily precise of all. Why? Because, after Lewis' body had been recovered, it was announceded that he had been found "2.1" miles from his home -- even though, as the crow flies, the distance appears to measure only about 1.6 miles on the U.S.G.S. map. And as for her apparently precise State Route "45" clue, read on. In July 1996, a skeptical Tampa attorney made a Florida Public Records Act request of the Williston police department to provide him with a copy of its entire file on this case, which he then forwarded to me. 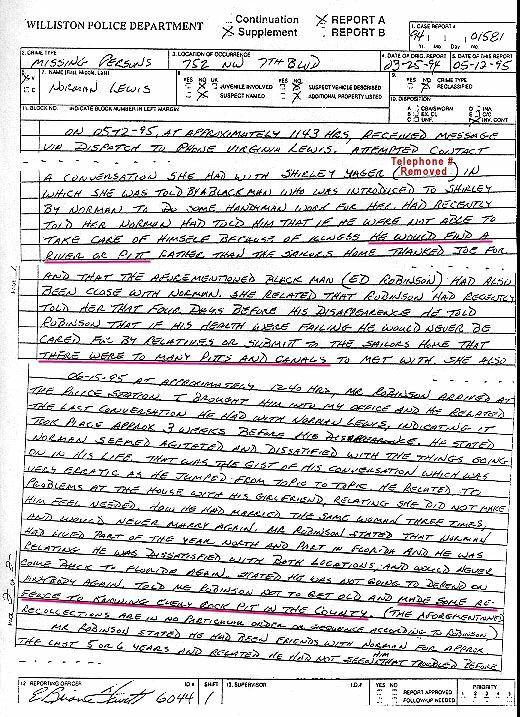 Investigator Hewitt responded by sending copies of all the paperwork, which included two items of immediate interest: a May 12, 1995, report (supplemented on June 15) filed by Hewitt, and the "clues" jotted down by Hewitt from Renier's July 17, 1995, "psychic" reading. handyman . . . had recently told [a client] that [Lewis] had told him that if [Lewis] were not able to take care of himself because of illness, he would find a river or pit rather than the [retired] sailors home. . . . Four days before his disappearance, [Lewis] told [the handyman] that if his health were failing, he would never be cared for by relatives or submit to the sailors home, that there were too many pits and canals. . . . [The handyman later] arrived at the police station . . . and he related [to Hewitt] the last conversation he had with Norman Lewis . . . indicating it [actually] took place approx. three weeks before his disappearance. He stated Norman seemed agitated and dissatisfied with . . . his life [including having] problems at the house with his girlfriend, relating she did not make him feel needed. . . . Told [handyman] not to get old, and made some reference to knowing every rock pit in the county. . . . This "smoking gun" document had been previously unknown to me and to the A&E producer. But it was now apparent that as a result of his failing health and other personal problems (an early newspaper article had also described him as "despondent" over financial matters), Lewis had threatened to commit suicide in a "river" or a "rock pit." Further, word of this had begun to spread through his tiny community and had become known to the police two months prior to their session with Renier. Might Renier have actually learned of this, in advance, from the police? The Tampa attorney had also specifically requested any video/audio tapes of Renier's reading. After inquiring as to why only written records were released, Hewitt advised him that an audiotape did in fact exist and would be provided. As for a videotape, Hewitt wrote: "As I have advised you in several telephone conversations, the only [video]tape contained in the requested file . . . is of the recovery, which you indicated you did not want." Among the pages in the police file is a map of Williston with a 90 degree (L-shaped) area from 11:00 to 2:00 (not "9 to 12") drawn on it and labeled "Noreen's quadrant." The point of convergence of the two lines is correctly marked "Norman's House," and the quadrant includes the northern Whitehurst pit where the body was found (at about 1:00) but not the eastern pit that her clues appear to more closely fit (at about 3:30-4:00). In stark contrast to A&E's balanced coverage of the case on The Unexplained, the Sci-Fi Channel's Sightings coverage included no skeptical input. The Sightings narrator asks, but is not able to answer, the question: "Why did Norman disappear?" No mention is made of Investigator Hewitt's report, filed two months prior to Renier's "psychic" reading, regarding Lewis' "rock pit" suicide plan. But in fairness to Sightings, the police had also withheld this crucial information from the A&E producer. In Renier's re-created reading for the Sightings cameras, with her eyes closed, feigning a trance-like state, she strays from her original reading so as to now specifically associate the number "21" with miles: "Numbers -- 21. I feel miles." On the edited audiotape, there is no mention of "21" in any context (although, as shown earlier, "21" does appear in Hewitt's notes in the midst of a stream of numbers/letters with no particular regard to mileage), and the only numbers associated with "miles" are "45" and "4.5." Nor is there a "21" clue on the edited videotape (yes, it did finally materialize -- see below). This passage on the videotape appears to be a second "smoking gun," this time with regard to the particular body of water to which Renier's directions actually lead. As I earlier indicated, Renier's clues (as I understood them even before receiving this video) seemed to lead not to the Whitehurst pit (located north of Lewis' home) where the body was ultimately found, but rather to another rock pit much closer to, and nearly due east of, his home. During my two visits to Williston, I viewed the former Lewis residence, located on N.W. 7th Blvd. With the home on the right side of the street, proceeding straight ahead (as per Renier's "psychic" vision) leads southeasterly for approximately one-third mile, at which time the road curves left to a due east bearing, until N.W. 7th Blvd. ends at its intersection with U.S. 41, approximately one-half mile from the Lewis home. Another quarter-mile or so due east, dead ahead (no pun intended), is the massive "eastern" rock quarry, the most prominent feature on the Williston roadmap. Summarizing Renier's role in this case, the Sightings narrator says, "Investigator Hewitt put all of Renier's clues together, used some gut instinct of his own, and came up with one word -- 'Quarry.'" But we now know that Hewitt had actually learned two months earlier of Lewis' plans for ending his life in a quarry. And in the edited video of Renier's actual reading, she refers to the body of water not as a "pit" or "quarry," but as a "river" (although she appears puzzled as to why it goes "down" such a sheer cliff). The word "quarry" is heard once on the videotape, not after Hewitt has a chance to digest all of Renier's clues and apply his "gut instinct," but in the midst of the session, by an unidentified male questioner present with Hewitt in Renier's living room: "Now look at that quarry. As you're looking at it and looking at it from the entrance there. . ."
As for this "eastern" pit, a person with some inside knowledge of the police investigation (who allowed me to tape our conversation but requests anonymity) told me that this had been the "prime target for the investigation" immediately following Renier's reading. "They didn't think there was a [railroad] track [at Whitehurst]." At the conclusion of the Sightings report, the narrator explained how Renier's "22" clue (remember that stream of numbers?) had also been remarkably accurate: When Lewis' body was recovered, "the calendar date on Norman's diving watch was stopped on the number 22." For the record, he had disappeared and presumably committed suicide on the 24th of March, 1994. As a clue to the location of Mr. Lewis' missing body, "22" was utterly useless. The ultimate arrival of the edited videotape came as a complete surprise. When the audiotape turned out to have been heavily and crudely edited, the attorney wrote back to Hewitt requesting "a complete copy of the audiotape." Hewitt's reply explained that the tape "is the only audio tape I have regarding Noreen Renier's session [and] was expressly made [from a more lengthy original] for field use with regard to the location of Mr. Lewis." Most curiously, the letter continued: "You are requesting additional material. . . . We are under no obligation to provide you with any material without prepayment. Therefore, with your payment of [an additional $14.00] . . . I will forward to you the only remaining tape I have regarding this case." The attorney assumed that the "only remaining tape" was a video of the recovery of the truck and body, as Hewitt had previously indicated. Nonetheless, he decided to fork over the $14.00. Incredibly, a month later, he received from Hewitt the videotape which, despite having been edited down to about 14 minutes, still contained the "smoking gun" segment. In a letter accompanying the videotape, Hewitt informed the attorney that he had "filed for mediation with the State Attorney General's office . . . to assure you [that] we are in full compliance under the Florida Public Records Act." Through the mediator, the attorney then posed several questions, including these: "Why did the police department initially deny having a videotape and thereafter send us one?" "One map . . . depicts an area labeled 'Noreen's quadrant.' Who drew this quadrant on the map?" [see earlier discussion]. "What is the personal relationship, if any, between Detective Hewitt and Noreen Renier?" Another question relates to an undated police report, filed by Hewitt, which does not appear to comport with Renier's reading, at least as excerpted on the tapes. Writes Hewitt, "She picked out [Levy County Road] 501 on local map which I provided, indicating it was the road Lewis had traveled after leaving his residence, in a northerly direction." (Emphasis added.) CR 501 is the northern extension of Lewis' street, but according to the video's "smoking gun" segment, Renier actually indicated that he headed south. But the answers to these questions have not been forthcoming. The mediator has written back informing the attorney that the Public Records Act does not compel Hewitt to respond. And the City Attorney for the town of Williston has sternly weighed in: "[Y]ou have [already] received all public records in possession of the City relating to [this] investigation." Two final questions, fundamental to the very nature of "psychic" phenomena, require consideration. In my chapter on Renier [posted here and here] for the book Psychic Sleuths (edited by Joe Nickell, Prometheus Books, 1994), I showed at the time how Renier (like the rest of the psychics profiled in the book) had yet to convincingly demonstrate genuine "psychic" power under proper observing conditions. Has Renier now become the first psychic to successfully do so? Or might her "success" in the Williston case be explainable in more mundane terms, perhaps as the result of a combination of factors such as advance research, common sense/intuition, feeding back information gleaned from the police themselves, and "retrofitting" -- interpreting ambiguous clues, after the fact, as having been remarkably accurate and valuable "hits"? To those who believe in "psychic" power and other supernatural phenomena, the answers to these two questions no doubt remain "crystal ball" clear. And they remain equally clear, though through quite another prism, to those skeptics of the paranormal who demand extraordinary proof of such extraordinary claims. * The published magazine and book versions of this article mistakenly say "20 years." She has more recently moved to Virginia where she lived years ago.